Traditionally, optical spectroscopy had been performed by dispersing the light emitted by excited matter, or by dispersing the light transmitted by an absorber. Alternatively, if one has available a tunable monochromatic source (such as certain lasers), a spectrum can be measured 'one wavelength at a time' by measuring light intensity (fluorescence or transmission) as a function of the wavelength of the tunable source. In either case, physically important structures in such spectra are often obscured by the Doppler broadening of spectral lines that comes from the thermal motion of atoms in the matter. In this experiment you will make use of an elegant technique known as Doppler-free saturated absorption spectroscopy that circumvents the problem of Doppler broadening. The primary experimental objective will be to use this technique to measure the hyperfine splittings in the S1/2 and P1/2 states of Rb. 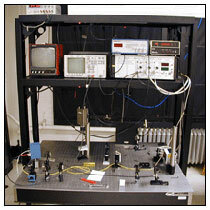 In addition, you will learn a bit about lasers in general and diode lasers in particular.